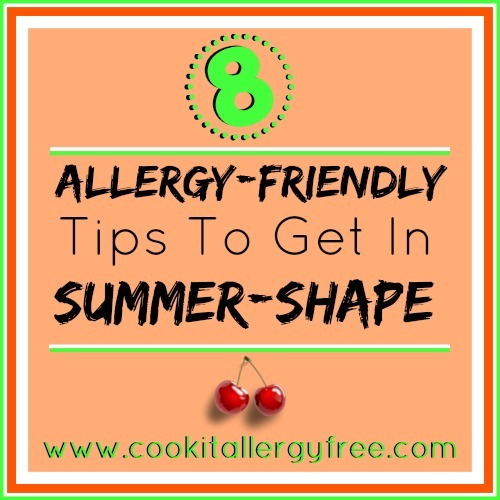 8 Allergy-Friendly Tips to get in Summer-Shape! How can it possibly be summer already? The boys are officially out of school for summer break…around here that means lots of cooking for all of those kiddos hanging around, lots of time in the sun, lots of fun, but also lots of time in shorts and swimsuits. It also means wanting to eat as clean as possible to feel confident in that summer wardrobe.. I thought I’d share some of my favorite ways to stay healthy and fit during these warmer months and also feel great in those shorts and swimsuits! Start every day with 8 ounces of water mixed with 2 teaspoons of Raw Apple Cider Vinegar – Great for digestion, boosting the metabolism, and cleansing the system. Take a quality probiotic or eat fermented foods every single day. Good examples are sauerkraut, kimchi, pickled ginger, fermented cucumbers, coconut yogurt, kombucha, water kefir, etc. Make One Small Change — And Stick To It. Make one goal for yourself at a time. Maybe it’s removing soda from your lunch or moving for five extra minutes a day. Just make it attainable and commit to it. Once you master that first goal, you can add another to it, and so on. When you do what you say you’re going to do, the scale will follow. Take 15 minutes each evening to plan out your meals for the next day. This simple task of planning ahead can help you stay right on track to reach those goals. Learn to LOVE Burpees. They may be tough but they target every muscle group and they get that heart rate up. Set a goal to do a certain number two times every day. Then try and increase that number. This is a great metabolic boost to your day. Try Interval Training. You can do it from home and it can be as simple as doing 10 sprints up and down your block. It is a great way to rev up your metabolism and your body will continue to burn more calories for the rest of the day. And if you feel like you’re needing more of a jumpstart to shed a few pounds before summer hits full force, or if you feel like you need a little clean-eating direction full of allergy-friendly foods, here’s a great digital two-week plan to get you going. This one has 2 weeks of done-for-you allergy-friendly meal plans and shopping lists, a cookbook with 30+ easy breakfast, lunch, snack, and dinner recipes, and 4 of those metabolic interval workouts that be done in under 30 minutes from absolutely anywhere… no gym or equipment needed. Plus… so many tips, tricks, and tools to keep you eating clean and feeling great all year long.